Studying female reproductive tracts and sperm in diving beetles (Dytiscidae), researchers from Syracuse University and the University of Arizona have obtained a glimpse into a bizarre and amazing world of sperm that can take on a variety of forms—including joining together into conglomerates that navigate the twisted mazes of the female reproductive tract. “Our findings show that sexual selection isn’t always all male-male competition,” says Dawn Higginson G’11, the study’s lead author, who is a postdoctoral research associate at the University of Arizona’s Center for Insect Science. Higginson did much of the work for this study while a earning a Ph.D. from the Department of Biology in SU’s College of Arts and Sciences. Her doctorate adviser was Professor Scott Pitnick. “Rather than standing at the sidelines, it appears that females can take the lead in driving the evolution of male sexual traits,” Higginson says. The study results were published Feb. 6 in the journal Proceedings of the National Academy of Sciences. 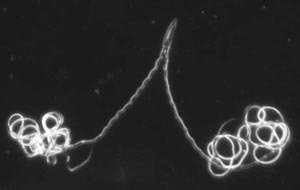 Unlike most mammals in which fertilization involves large numbers of simply-built, individual sperm cells racing for the egg through a rather straightforward female reproductive tract, many other animal groups, especially invertebrates such as mollusks and insects, have evolved complex anatomical variations in both sperm and female reproductive organs. In an attempt to better understand sperm evolution, Higginson and Pitnick came across descriptions of paired sperm in diving beetles dating back more than a hundred years. Female reproductive tracts in these animals were not systematically investigated until 10 years ago. Previous studies on the interaction between sperm and female reproductive organs established simple relationships between the two such as duct length and sperm length, but did not look much farther than that, Higginson says. Higginson then set out to investigate what evolutionary forces are the most likely to drive all this unexpected diversity. In an unprecedented effort, she measured many different parameters, such as overall sperm length, head length, tail length, length of the female ducts, area of the sperm storage chambers, presence of conjugates, head shape and so on. Using statistical tools to analyze evolutionary relationships among traits, she then reconstructed the most likely evolutionary relationships between sperm and female reproductive tracts. Pitnick adds that given that no other cell type evolves as rapidly as sperm, variations in compatibility between sperm and the female reproductive system could be an important engine of speciation. “One reason for this situation in which sperm from different males compete inside the female may be that females can mate with whomever they encounter and choose later,” she says.